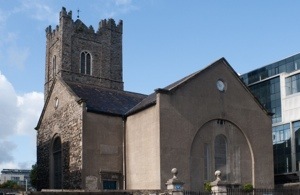 Founded in 1095, the present church was built in 1685. The church itself is worth a visit and has some notable features inside including a beautiful organ, one of the oldest in the country, and still in use. Legend tells us Handel practised on the organ for the first performance of ‘Messiah’. But it’s what lies underneath that draws the morbidly curious. 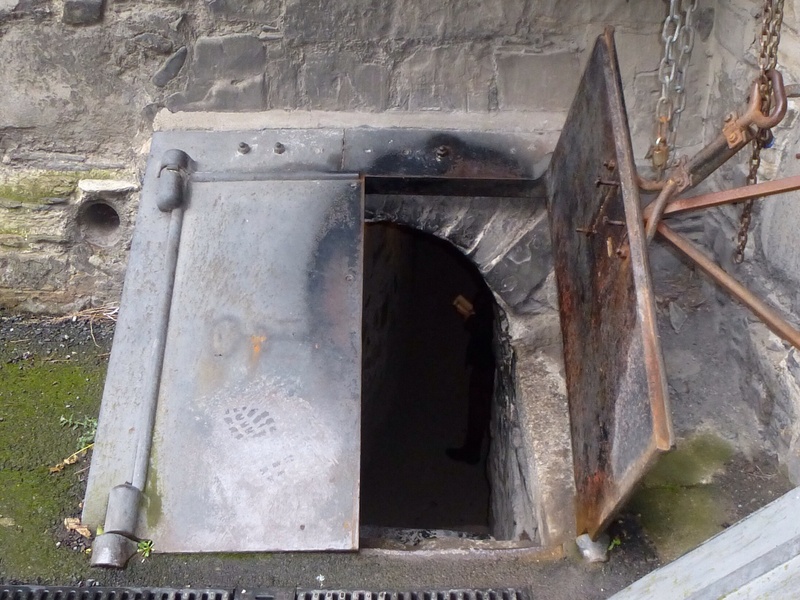 Underneath the church lie the vaults which are accessed from the outer side of the building through some metal doors and down some old steep stairs. 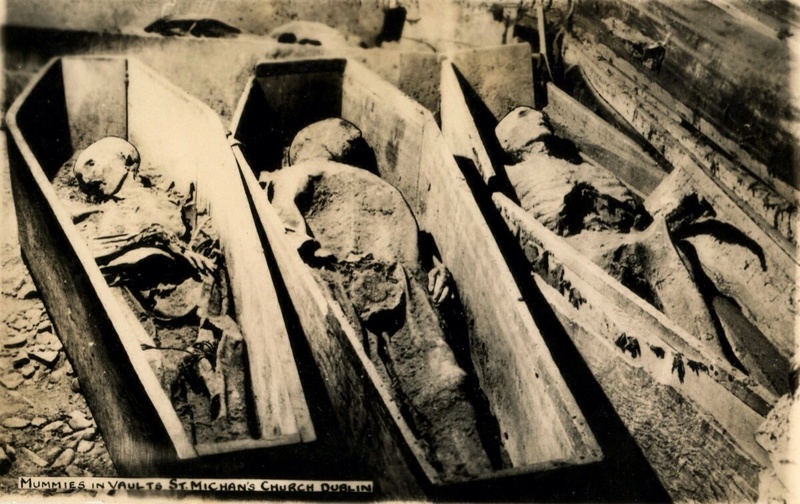 There are 5 burial vaults full of coffins containing the mummified remains of many of Dublin’s most influential 17th, 18th and 19th century families. The main “attraction” however is the 4 open caskets displaying the naturally mummified bodies of 4 individuals. The constant dry atmosphere and high lime content has caused the mummification of the bodies and the preservation of the coffins. There is a high methane presence in the boggy soil which might have also stopped the decay. Spectators have been visiting since the Victorian age and it was probably the ever imaginative Victorians who “identified” 3 of the bodies as that of a thief (his hand and both feet have been cut off), a nun, and a tall crusader (whose body has been cut to fit in the coffin, his legs broken and crossed). Legend says that touching his finger will bring you good fortune. However… science has dated the “Crusader” at only 650 years dead. Science could be wrong though, now stay with me on this one, I mean, maybe he’s that crusader bloke who drank from the Holy Grail in Indian Jones which means the Grail could indeed be buried at St Michan’s? Yeah? Ok, it was most defiantly some creative Victorians. Bram Stoker is said to have either visited as a child and/or brought his family here for a visit so I’d like to think he helped spread the tales. In the last vault we find the coffins and a copy of the execution warrant of the Sheare brothers who were executed by the British following the Rising of 1798. The coffins were replaced in the 1990’s and it was discovered that they had been hung, drawn and quartered. A sobering and serious reminder of Ireland’s political struggles. So I would highly recommend a visit to St Michan’s. You’ll find that many Dubliners haven’t visited or even heard of it and it’s less than the price of a pint for the tour so go, go now (while you can still have a stroke of the ‘auld good luck finger’ before anyone takes my opinion into consideration and professional museum standards are suddenly adhered to! I like what you are doing here………wouldn’t like to grow my vegs in that boggy soil.